After you have successfully installed EventON and activated eventON follow the steps below to add eventON calendar to your site. What’s a calendar without events right? After you install and activate eventON you should see Events menu on left side panel on wp-admin where you can add events. Adding the calendar using shortcode method is easiest way. Follow the below steps to add EventON calendar to your site using shortcode method. Right next to Add Media button above WYSIWYG editor you will see Add Eventon button (shown above) Click this button to open shortcode generator. From the pop-up easy shortcode options box select the type of calendar you want to add to your website. Depending on the type of the type of calendar you choose you will be moved to a different screen to choose more options. 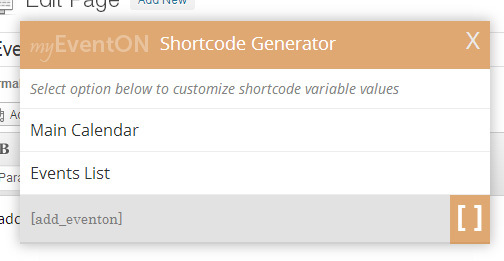 Once complete click [ ] button on the bottom right corner of shortcode generator popup box. You should now see a shortcode appear inside the WYSIWYG editor. (For Advanced users) Template tag method require editing the PHP code of your website template. Open the page template in a text-editor and include the following php code where you desire to display the EventON calendar. Another approach would be to use do_shortcode() wordpress function like below. Read More about how to use template tag with parameters. Ready to setup your calendar? Get notified on product updates and tips.